If you are traveling to visit us at The University of New Orleans, we are situated on the south shore of Lake Pontchartrain, within the limits of the city of New Orleans. 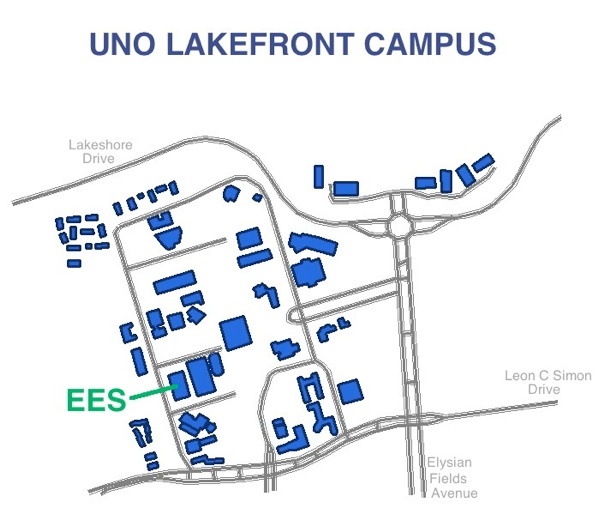 About 20 to 30 minutes from Downtown New Orleans, UNO occupies a 345-acre campus in one of the finest residential areas of the city. Offices of the MP2 Research Group are located on the ground floor of the Geology Building, found near the southwest entrance to the University Campus.
. . . Upon arriving in New Orleans, get on Interstate-610 and get off at Exit 4 (Elysian Fields Ave.). Head north to Leon C. Simon Blvd. and turn left. Proceed to the second traffic light (Waldo St.) and turn right. The Geology / EES Building is the third building in from the corner. Pay parking is found at the second and third driveways after passing the building.